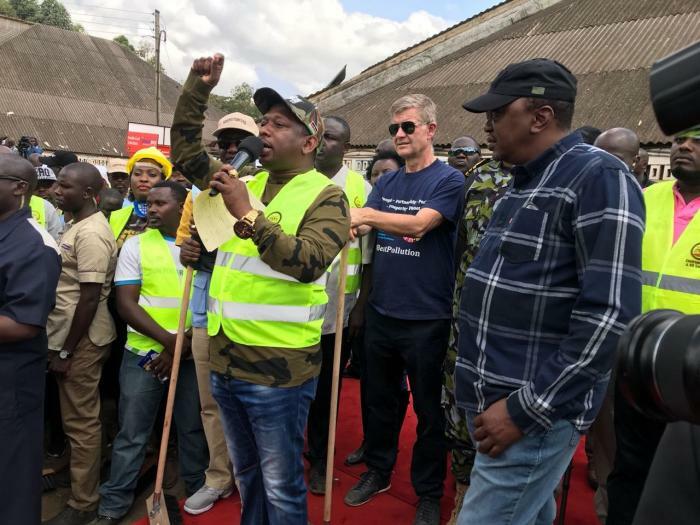 Governor Mike Sonko was joined by President Uhuru Kenyatta in the monthly beautification exercise of Nairobi county clean up. The major exercise, held at Uhuru Market, saw President Uhuru Kenyatta get his hands dirty to remove garbage from the streets. President Uhuru commended Governor Sonko for the cleanup exercise and warned Murang’a County Governor to stop threatening Nairobi County with water as it is meant to benefit the public. He said that the objective of improving the lives of Kenyan citizens cannot be achieved if there is no unity among leaders. He urged leaders to focus on delivering their service to Kenyans instead of politicking over 2022 general elections. “Jameni, tunajua kila miaka tano, tuna uchaguzi… si tugonje jameni miaka tano ifike ndio tuanze siasa ya uchaguzi huo mwingine?” he posed. The President urged leaders to stop public quarrels and respect each other. “Tuheshimiane kama viongozi. Hakuna maendeleo ya Jubilee, ya ODM au Wiper… maendeleo ni ya wakenya. Nashukuru viongozi wa Nairobi tukisema tutabadilisha maisha ya watu wetu,” he said. President Uhuru also gave a warning to traders who are selling maize flour above the set price of Ksh75 per 2kg packet. He promised to take action against them for exploiting Kenyans. The monthly clean up exercise was kicked off in Uhuru Market and was simultaneously carried out in all 85 wards in Nairobi County.